Heat wave in New Jersey! Monday was the hottest day of the year so far. The horses were grouchy, the flies were biting, and the temperatures did not relinquish much even after the sun dropped. I headed over to the barn to check on the herd, put Wizard and JR out for the night, and possibly hop on Selena for a quick spin. 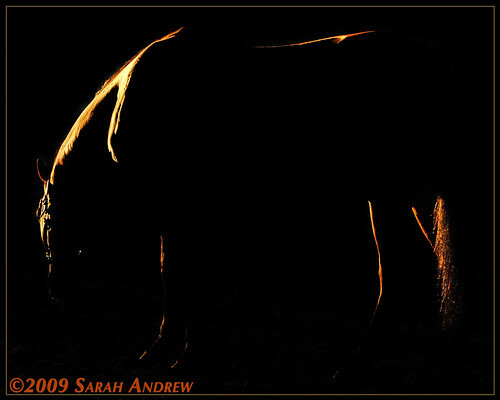 I arrived late at the barn to try to catch the cool night air. It was bearable but still quite hot. I took Selena out of her stall and before we got to the crossties, she nickered a few times. After tacking up, I led her into the arena and walked her around each way in hand. I am pretty sure she is in a heat cycle. It was an OK ride. We did a little leg yielding and a few big circles at the walk and trot and called it a night. It was too hot to push her. I am sure that she would have obeyed me if we continued, but I did not want to stress her (or me, argh!) on a hot night. I hosed her off, scraped with a sweat scraper, hosed again, scraped again, and she was nice and cool. I took Wizard out of his stall and my eye immediately dropped to his left hind coronet. An abscess! This is the first abscess I’ve seen in the 11 months I’ve been working with him. Since he was not unsound and the abscess was on the coronet, I soaked it in warm water and Epsom salts and left it unwrapped. My farrier is due out on Thursday so I’ll ask him his thoughts on why it happened. It is interesting to note that the abscess occurred in the opposite hind leg from the one that was injured. Perhaps he bruised it compensating for the right hind leg? Or perhaps it is simply a summertime ailmant that came out of nowhere. Either way, I’m glad it burst and is healing so nicely. What did the farrier say about the abscess?